Proposal 2 outcomes by county. Yellow indicates that county voters supported the measure, orange indicates a no vote between 50 and 60 percent, and red indicates a no vote of 60 percent or more. Map by Audrey Spalding. Michigan voters' rejection of Proposal 2, a ballot initiative that would have given broad and sweeping power to government employee unions, was geographically widespread. Of Michigan's 83 counties, all but two rejected Proposal 2 on Tuesday. In fact, 64 counties — more than three quarters of all Michigan counties — rejected Prop 2 by more than 60 percent. Ottawa County voted overwhelmingly against the proposal, with more than 75 percent of voters rejecting it. The only two counties that voted for Prop 2 were Genesee and Wayne counties. Approximately 60 percent of Wayne County voters and 54 percent of Genesee County voters approved the measure. Though the vote on Proposal 1, the measure to keep Michigan's stronger emergency manager law, was closer, support across the state for it was concentrated near cities and school districts under emergency manager oversight. 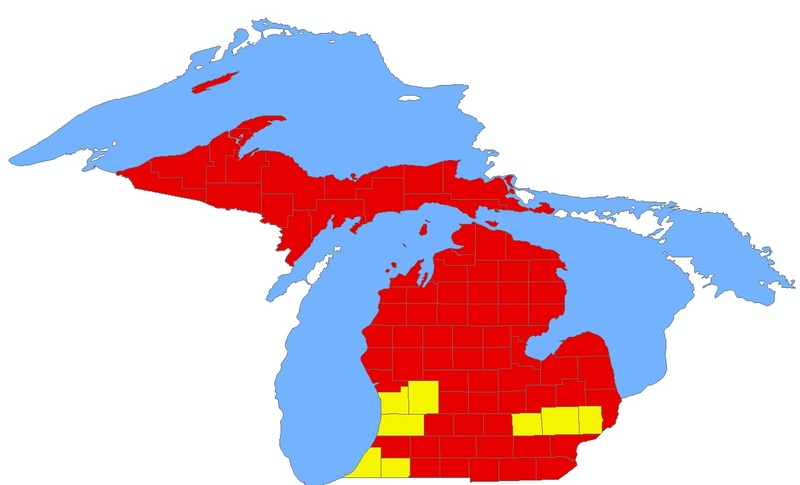 Only eight counties in Michigan voted for Prop 1: Macomb, Oakland, Livingston, Berrien, Cass, Allegan, Ottawa, and Kent. Seven of these counties either have a school district or city under emergency management, or border a county that does (see map here). Berrien County, for example, contains Benton Harbor, which has been under emergency manager oversight since 2010. More than 63 percent of Berrien County voters voted for the stronger emergency manager law. This was the strongest showing of support from any county. Livingston County, which borders both Genesee and Oakland counties (where the cities of Flint and Pontiac are under emergency manger oversight), was the next-largest supporter of Prop 1. More than 62 percent of voters there supported it. Oakland County voters supported Prop 1 at a rate of 57.7 percent. The county contains the city of Pontiac and borders Wayne County, where the Detroit school district has been under emergency manager oversight since 2009. Wayne, Muskegon and Genesee counties rejected Prop 1, though each of these counties contains school districts and cities under emergency manager oversight. More than 60 percent of Wayne County voters voted against Prop 1. Interestingly, Wayne County did not provide the strongest “no” vote. The entire Upper Peninsula and nearly the entire northern half of the Lower Peninsula voted against the measure by 60 percent or more. Will Michigan Follow California’s Lead In Redistricting?